We live in exciting times. More and more information becomes available about the wellbeing of the earth. It’s about climate change, long term energy supply and how to keep the earth as our home ground in let’s say 2050. We’ll need to make a lot of changes to make that happen. But on the other side, there are lots and lots of opportunities. Regarding the clothing industry, there is a lot possible as well. It is no secret anymore that the industry is one of the most polluting industries in the world. For example, the industry accounts for 10% of the annual carbon dioxide emissions. But solutions are available. 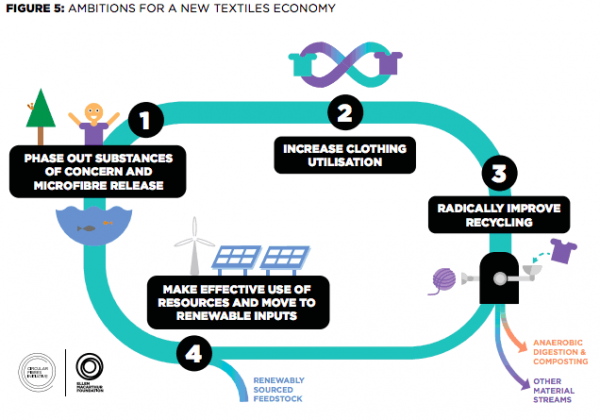 This information is available in a great and well-written report from the Ellen MacArthur Foundation, ‘A New Textiles Economy: Redesigning Fashion’s Future’. I would recommend to everyone to read this report full of facts and deep analysis. But it’s more than 100 pages, and aimed specifically for the fashion industry. But, thankfully, most of the report can be summarized with two infographics (that are presented in the report itself). The image shows the future state of the clothing industry. The first picture, the current state of the clothing industry, doesn’t need anymore explanation. It’s bad enough already. Those lists make me happy! 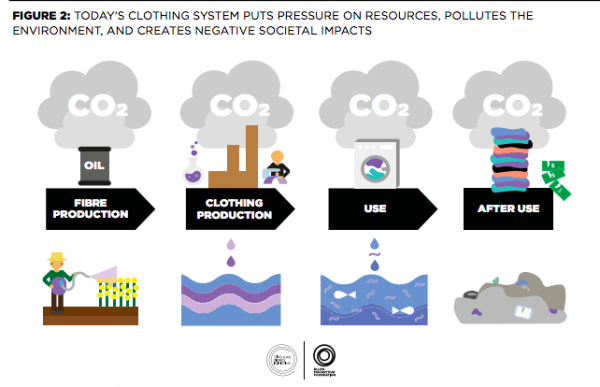 To me, such a list is a great blueprint of a sustainable clothing industry. Of course we’re not there yet, and the journey from Picture 1 to Picture 2 will be a long one. But it’s about the development. Sustainability is a journey. Use of organic cotton (no pesticides) which is grown with 60% less water. Minimal use of plastic (no plastic buttons) and formaldehyde (which is as bad as it sounds). Increase utilization by offering high quality. The SKOT shirts are very durable. Improve recycling: give your SKOT shirt back to us after use! We will recycle it, and you’ll receive a 10% discount on your next purchase. Effective use of resources: less water use, buttons of recycled coconut and production in Europe to minimize transport. Of course a lot more is possible. And we are working very hard on improvements, also in 2018. But in the meantime the business model of SKOT is better represented with Picture 2 than the other one. And I’m proud of that today!